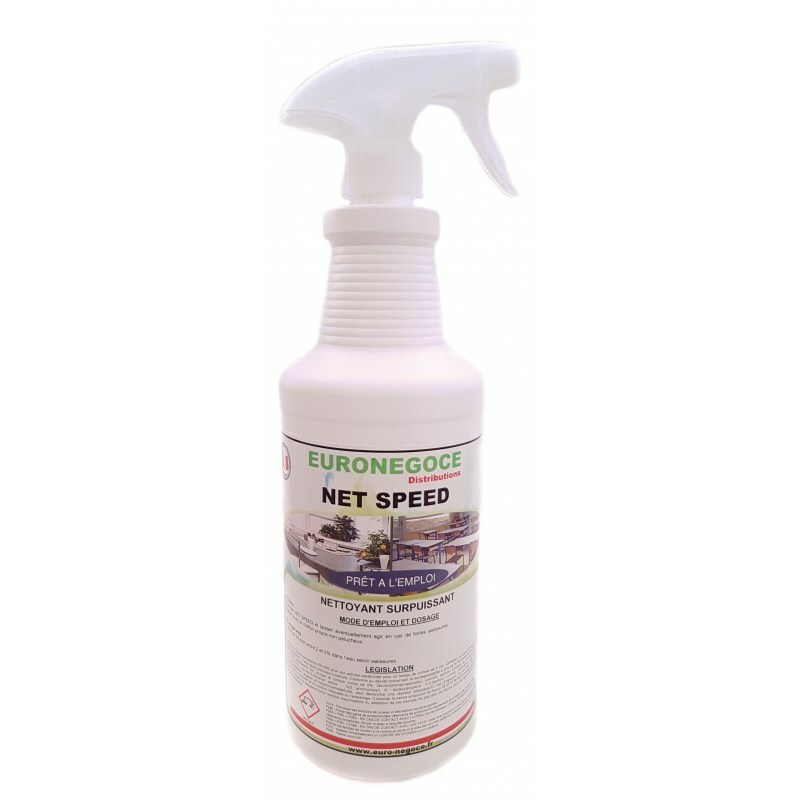 Euronégoce Distributions presents you with an incredibly efficient cleaning product: the Net Speed multipurpose cleaner, which thanks to its powerful formula can eliminate stains from all sources, be they fats, oils, ink, etc. This product is compatible with use on stainless steel surfaces. Capacity of a bottle 1 liter. Euronégoce is proud to present its ultra efficient cleaning product, designed to eradicate all types of dirt, such as grease stains, oil, ink or even paint. This product treats many surfaces, such as your floors or metal surfaces, while preserving more fragile materials such as stainless steel. This product is available in 1 liter bottle. This Euronégoce cleaning product is bottled in the large capacity of 1 liter, allowing you to clean many items. It has a pH of 13.2 giving it the characteristics of a powerful base, so it can very effectively eliminate all types of tasks, even the most tough, such as grease stains and oil paint. The power of its formula brings in addition a bactericidal effect. This slightly viscous yellow fluorescent liquid consists of a mixture of surfactants, alkaline salts, sequestering agents, solvents and preservatives. It is more than 90% biodegradable. The formula of Net Speed ​​multipurpose cleaner is deposited in a poison center competent and meets the standards of safety and hygiene in force. May cause skin burns and eye damage, therefore provide adequate safety equipment. For use in spray, spray your product and leave in case of major stains. Wipe with a clean, lint-free cloth. For a washing of your floors, dilute 2 to 5% of product in the water according to the severity of the tasks to be cleaned. Do not use Net Speed ​​Cleaner Trading on aluminum or raw metal surfaces. In case of prolonged use, the wearing of gloves and glasses is recommended to ensure your safety. Keep it in a cool place out of the reach of children. Euronégoce cleaning products are manufactured in accordance with all safety procedures in force and comply with the decree on cleaning products for equipment in contact with foodstuffs, and their formula is deposited in approved poison control center. By purchasing the Net Speed ​​cleaning product you choose reliability and quality.